When we had this case study turned into us, we couldn’t believe the results. It is about an Alzheimer’s patient who couldn’t remember her grocery list while at the store, lost her keys consistently, couldn’t remember her grandchildren’s names, and couldn’t remember how to sew (which was her previous career and favorite past-time). She went through IM and that all changed. Read the case study to find out how. Interactive Metronome (IM)has not been widely used with Alzheimer’s patients. To date there is no published research that clearly shows a link between the use of IM and clinical outcomes in patients diagnosed with Alzheimer’s. But sometimes patients are running out of hope. And sometimes their care providers take chances. This is one of those cases. Kathy Lambert was 67 years old when she was diagnosed with Alzheimer’s . Whether it was the doctor’s advice that there was “no hope” or the shock of the diagnosis that contributed to her rapid decline doesn’t matter, Kathy’s functions disappeared quickly. Kathy had spent her life as an upholsterer. She and Larry had been married since high school. Self-described “hard working country people” they pleaded with their doctor for something to try that might help slow down the effects of Alzheimer’s. Their doctor referred them to the Brain Fitness Center when Kathy was 2 years post-diagnosis. The Director of the Brain Fitness Center, Nancy Thomas, met the Lamberts together. She noticed that Larry did almost all the talking. Kathy was stooped. She constantly looked down at the floor afraid to speak. She was still aware enough to realize when she lost track of the conversation so she reacted by keeping quiet. Depression was mixed with the typical symptoms of dementia. Larry reported that Kathy could no longer find items in the grocery store, she constantly lost her keys and forgot her grandkids’ names. Worst of all, her career and joy of upholstery had disappeared. Kathy sat folding and re-folding fabric unsure what to do with it. 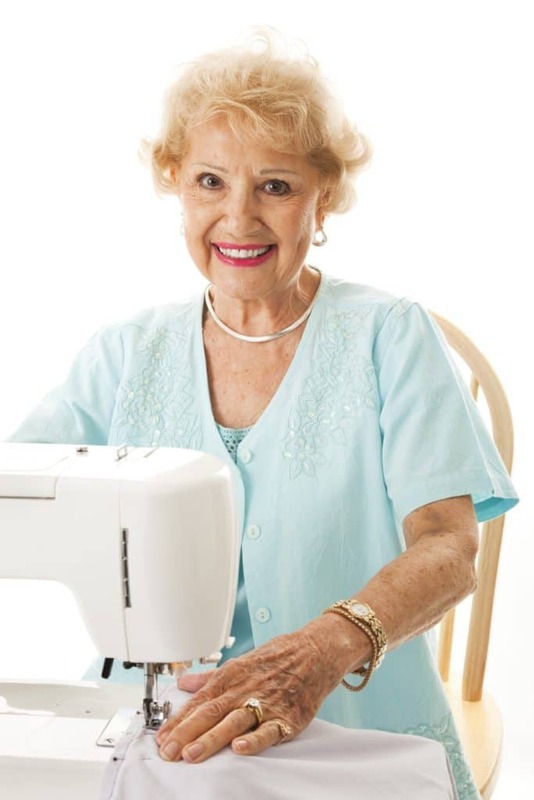 In time the family removed her sewing machine for fear that Kathy would try to sew and hurt herself. Lastly, her muscle tone had declined to the point where Kathy had trouble walking unassisted. This was it. This was Alzheimer’s. The Brain Fitness Center specializes in exactly what its name indicates. It serves clients from 6 to 87 years old with dyslexia, cognitive processing disorders, reading fluency deficits and non-verbal learning disability. Nancy Thomas has seen the benefits that therapy technology can create when used appropriately with the most challenging patients. She decided that she would start Kathy by assessing her motor planning and sequencing on the Interactive Metronome. Kathy performed her initial assessment while seated since she had trouble with prolonged standing. Even assisted Kathy couldn’t perform the heel strike exercises. Her millisecond averages were below average and she couldn’t tolerate the introduction of IM’s Guide Sounds. Nancy decided that she would modify the IM’s settings to Kathy’s ability and then start increasing the length and difficulty of the program. Kathy came in 5 days a week for the first 2 weeks and then slowed to a 3 times a week schedule. Nancy reported “After the first two weeks it was like seeing a butterfly come out of its cocoon. Kathy stood taller and her gait was improving.” Even still she had trouble with any exercise that required stepping backwards onto the heel. Therapy continued. After three months of therapy at the Brain Fitness Center Kathy purchased an IM Home and decided to increase her own therapy program to 7 days a week. She exercised every day until her IM scores were above average, including her heels! Despite never having used a computer Kathy was managing her own therapy regimen. Other objective measures used by Brain Fitness Center showed that was achieving “prolonged attention” and “time on task” increases. When Kathy visits the Brain Fitness Center today she is alert and cognizant. Nancy describes her as “delightful and delighted. Her shoulders are squared, she makes eye contact, her memory is improved enough to navigate the grocery store and her sense of humor has returned. Kathy recently demonstrated the use of Interactive Metronome at her local Traumatic Brain Injury Support Group. She is back to work as an upholsterer and has “a whole lot more years of real life”. The Interactive Metronome is a mainstream therapy tool that engages patients and drives them to improve their rehabilitation outcomes. IM has over 15,000 providers in hospitals and clinics throughout the United States and Canada. Nancy Thomas has been an Educator for over 30 years. Before opening the Brain Fitness Center in Parkersburg, West Virginia she spent the previous 20 years as a Special Education Teacher. While Alzheimer’s is currently an incurable, degenerative disease there is evidence that complex motor-cognitive exercises can slow functional decline. IM’s clinical application has always outpaced the published research cycle. Nevertheless, IM Providers continue to push the envelope seeking to help those who need it most.